[00:43:00] <jepler> are there two /usr/realtime* directories? if so, remove it or specify the right one to configure. [00:52:39] <jepler> did you re-run configure after you changed kernels? [00:56:37] <jepler> are there two /usr/realtime* directories? if so, remove it or specify the right one to configure. [00:56:49] <fenn> yes there are two.. how do i specify the right one? [01:31:04] <fenn> SWPadnos: have you succeeded in compiling emc2 on an upgraded dapper? [14:51:53] <Roguish> SWPadnos: a little question off topic? can a bad power supply cause a computer to 'auto' reboot? [14:52:59] <Roguish> that's what i have. i thought it might be my kvm, but it's started again. [14:53:12] <SWPadnos> interesting. how old is the power supply? [14:55:34] <Roguish> i've eliminated all 'program' problems, so it has to be hardware. ps, motherboard, or cpu? [14:57:03] <Roguish> day or 2? that long? [14:58:39] <Roguish> 1 gig, in 2 pieces. how about switching the pieces in the slots? [14:59:32] <Roguish> ok. machine is aloways on so i dont' think it's a heat problem. [15:02:19] <SWPadnos> do you have an ubuntu CD? [15:07:31] <Roguish> also watching the tour de france. last few kilometers of the day's race. [15:08:41] <SWPadnos> what kind of MB is this? [15:09:19] <Roguish> dual i believe. [15:09:35] <Roguish> just booted again. and started memtest. [15:11:25] <SWPadnos> do you mean Memtest86+ ? [15:14:13] <Roguish> thanks, just got it. [15:15:50] <Roguish> hey, what is the 'minimum' cpu for a emc2? to really run good. [15:16:44] <Roguish> my test unit is on an old dell p2, 400. it's running 1 servo ok, but not 2. [15:18:02] <Roguish> i have the m5i20 going. using the mesa 7i33 to get +-10 from the pwm. yaskawa drives and matching motors. [15:19:22] <Roguish> with number of axes = 1, the drive and motor are ok. with axes=2, the motors are pretty unstable. [15:21:41] <Roguish> that's what i thought. i don't have a faster test machine. probably will pick up a motherboard/cpu combo at Fry's, w/ mem. and drop it in the same case. [15:22:33] <Roguish> any ubuntu preferences: intel or amd? [15:23:05] <Roguish> is it the 'wintel' cartel? [15:26:35] <Roguish> hey. the yaskawa drive takes a +24v for it's enable and alarm control system. the 5i20 is TTL (right?) i've been bypassing the enable output of the 5i20, but i don't want to. what's the best way? [15:27:13] <jepler> a transistor or optocoupler? [15:28:04] <Roguish> i was thinking opto22, but they're a bit pricey. 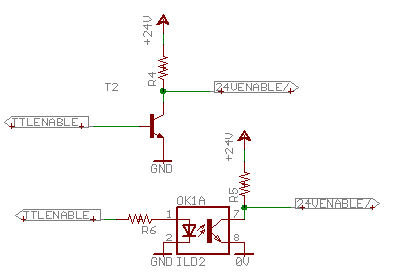 is there a simple opto circiut? [15:29:24] <Roguish> i need to order a couple fets from arrow, so i couild get some opto isolator chips too, just don't know what to get. [15:32:27] <Roguish> gotta name and number? [15:36:09] <Roguish> yeah, i like the isolated one in your picture. [15:45:59] <Roguish> got bumped off. could you put up your circuit picture link again?